When a tsunami rages through their coastal home in India, sisters Ahalya and Sita are left orphaned and alone. Searching for protection in a devastated landscape, they are thrust into a seamy world of violence and underground commerce. In Washington, D.C., attorney Thomas Clarke, facing his own personal and professional crisis, makes the fateful decision to pursue a pro bono sabbatical in Mumbai, India, with a non-profit organization that prosecutes the region’s human traffickers. Though Clarke and the sisters are separated by half a world, their destinies are intertwined. Clarke makes it his personal mission to rescue them, setting the stage for a riveting showdown with an international network of ruthless criminals. 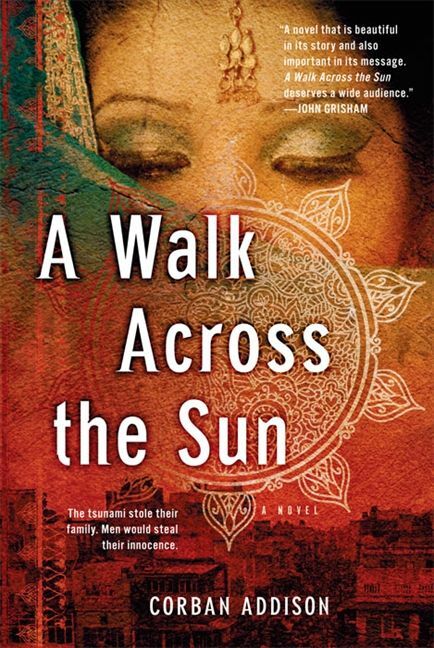 Spanning three continents and two cultures, A Walk Across the Sun is a suspenseful, fast-paced and moving journey through the underworld of modern slavery and into the darkest—and most resilient— corners of the human heart.